Lightweight construction of automobiles reduces fuel consumption, and hence, the emission of pollutants. Magnesium (Mg) alloys can be good candidates since Mg is the lightest structural metal with the highest specific strength. However, their low corrosion and wear resistance properties need to be improved. 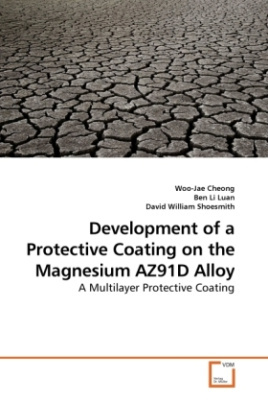 Electroless nickel (EN) deposition was chosen as a viable option to improve the corrosion and wear characteristics of AZ91D Mg alloy, and extensive research was conducted to develop a novel multilayer protective coating process, including immersion copper (Cu) and EN deposition. This book summarizes our efforts on the coating development as well as characterizations of the metalizing solutions and the coatings.